But we continue to try, don’t we? Thankfully, God doesn’t play by our rules. On this week’s edition of Faith Conversations, I’m pleased to dialog with Michael Hidalgo. He is the lead pastor of Denver Community Church. He is an author and writes regularly for Relevant magazine. 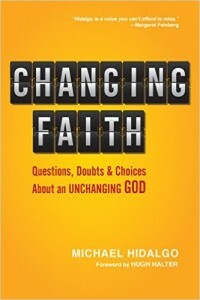 What I appreciated about talking with Michael is that he has truly grappled with issues of faith and doubt. He isn’t just writing and talking from a perspective of a pastor counseling others who’ve questioned. He has asked some of the same questions. Many of us used to claim 100 percent certainty about a lot of things. As we find ourselves in a changing world, our faith doesn’t go away, but it certainly has to change. Many of us are weary of those who claim Christ but solely define themselves by what they are not. Hidalgo talks about remaining open so we can completely engage with the heart of God so we can view and embrace this world the way he does. A tall order? Yes, but we are talking about following a big and wild God who is indescribable. If you are grappling with doubts, this week’s podcast is for you!